When Instant Pots came out, they were an instant success! But with so many of us having too many appliances in the kitchen already, including coffee machines, slow cookers and mixers, do you really need another one? Here’s the low down on what an Instant Pot is, with all the good and bad, so you can decide if your pantry or countertop can take just one more appliance! At a basic level, an Instant Pot is a multi-cooker appliance that can do seven jobs, in one pot. You can use it as a slow cooker, a pressure cooker, a rice cooker, and a steamer. You can also use it to brown foods, warm them, and even make yogurt, if that falls into your wheelhouse! With all that in mind, if the Instant Pot is for you, it might replace some of the gadgets you currently have in your kitchen, freeing up more space for other items! As a pressure cooker, it will cook food evenly and more quickly than other methods. You can also skip steps with a pressure cooker, like pre-soaking beans before adding them to a soup recipe, for example. As a slow cooker, it will prepare all your soups and stews to perfection, without much help from you. As an all round machine, it uses the heat source that is built into the base to to brown meats, sauté vegetables, or steam, with added liquids. You can even simmer sauces to reduce them and enhance the flavours. The advantage here is that you aren’t doing part of your cooking on the stove top first. It all can happen in the Instant Pot. As a rice cooker, it will prepare evenly cooked rice, every time. How does an Instant Pot work? As a pressure cooker, the Instant Pot traps the steam from liquids that are boiling in your pot, raising the temperature in the pot to a very high degree and raises the boiling point of the liquid, which contributes to that high heat. Between the heat and the steam, foods cook faster and more evenly than stove top. You can throw out your slow cooker and just use an Instant Pot for braising meats, making soups and stews that require a little time. It’s one less item cluttering your countertop. So how can it sauté / brown meats and vegetables if it’s all about steam and boiling? Because the heat source is at the base, when you activate the sauté function, it works much like your stove top, heating the pot from the bottom up. TIP: Follow Instant Pot recipes to the letter at first, until you get comfortable with using it and all the settings! Who is an Instant Pot best for? Likes to prepare meals in advance, through batch cooking and freezing or even par cooking some ingredients, a few days ahead of time? You can use the Instant Pot to get through some of these tasks faster. If you are a meat eating family but are notorious for forgetting to take said meat out of the freezer? You can cook meat from frozen in the Instant Pot. It won’t be a perfect texture and you’ll have to adjust your cooking times to accommodate the frozen meat, but it works and will save you the expense of ordering pizza instead! If you prefer your food to be cooked for you. Don’t we all wish for a chef? Well, the Instant Pot comes close! You don’t need to mind it as you would a pot on the stove. If your family loves soups, stews, chilis and all things that contain beans and other legumes? You can simmer and stew ground meats and veggies in less time and with less bother than in a pan. The Instant Pot is the perfect ‘one pot meal’ device. If you like dishes that have multiple steps to create them, but HATE the many pans to clean and time it takes to manage those multiple steps? You can sauté, braise and steam, all in the one pot. What foods work really well in an Instant Pot? In the meat department, you can cook any chicken dish that doesn’t require a crispy skin: so curries, stews, pulled chicken. With beef or pork, tougher cuts do well because they tenderize during the cooking process, but whatever the recipe, you can brown your meat first by adding it into the pot before you add liquids. After that, you can add your liquids and continue to cook, either as a pressure cooker or slow cooker, and you’ll have the basics you need for a lovely sauce! Beans, legumes and veggies all work well in the Instant Pot, and using the pressure cooker settings allows you to manage that in half the time of a stove top. Steamed vegetables are best, though you can sauté onions and garlic in preparation for a fabulous soup, stew or sauce too! The pressure cooker settings are also perfect for rice, and in particular if you are a fan of sticky rice! It’s a faster cooking cycle too and doesn’t require you to watch it at all. Do you like hard boiled eggs but always run into the problem of sticky shells that are hard to peel off without losing chunks of egg in the process? Pressure cook them! It’s still about the same time as stovetop but the shells peel off easily. For dessert, cheesecake and custards work well on the pressure cooker settings because these types of desserts do well in a moist environment. Most require you to cook them in a bain-marie (double boiling in water), in the oven, so the pressure cooker creates a similar environment. What can’t or shouldn’t you cook in an Instant Pot? Cooking a whole chicken won’t work well in that the texture of the skin will be seriously displeasing to the eye! Basically, anything that needs a crispy exterior shouldn’t be cooked in an Instant Pot. That said, you can cook ribs in it and just put them under the broiler to finish off! Sautéed foods that take less than 10 – 15 minutes on the stove top. It won’t be faster in the Instant Pot and you might get slightly better caramelization on the stove. Fish can be cooked with the pressure cooker settings, and really well too, but you can easily overcook it, so experiment before you have your boss over for dinner! Pasta. That said, you can put together a lasagna in an Instant Pot, as long as you know you won’t get that crispy top that you would get in an oven bake. Depending on what meals your family prefers, the Instant Pot might be just the ticket to save time and effort in getting a hearty meal on the table. 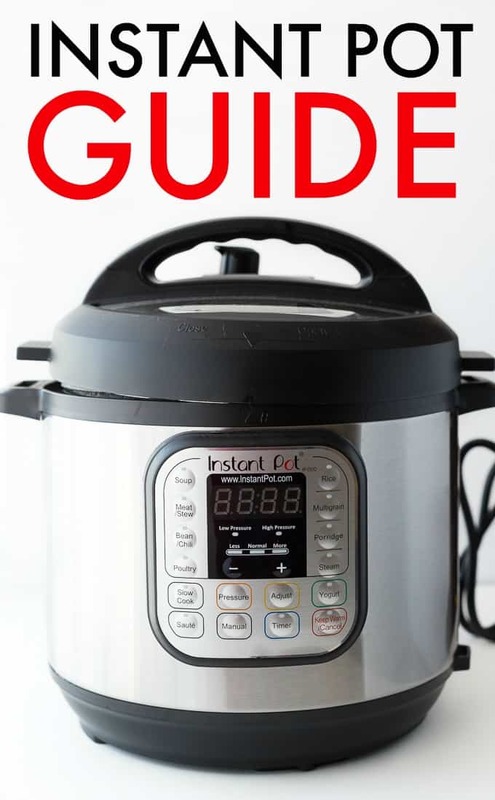 You might also like these Instant Pot gifts, Instant Pot resource guide and Instant Pot recipes. Do you have an Instant Pot? What’s your experience been like using it?